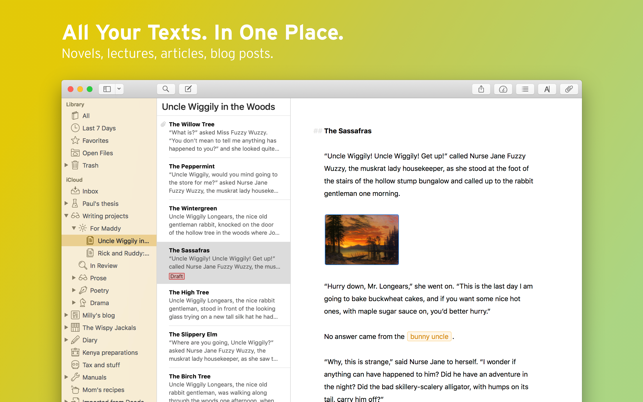 Ulysses is your one-stop writing environment for Mac, iPhone and iPad. 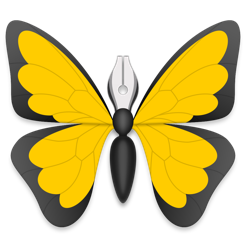 Its pleasant, focused writing experience, combined with effective document management, seamless sync, and flexible export, make Ulysses the first choice for writers of all kinds. Ulysses’ markup-based, distraction-free editor lets you focus on your most important task: Write, edit, and write some more. Formatting is kept for later, so you can completely immerse yourself in the text. Ulysses’ uniquely streamlined toolset covers the entire writing process, and its clean and simple interface will boost your productivity. From first to final draft, from prologue to closing chapter – Ulysses keeps you in the flow, so you can get stuff done. Everything you’ll ever write is stored in Ulysses’ unified library. You can manage projects of all kinds and sizes, be it novels, diaries or study notes – they are always save, and automatically in sync. 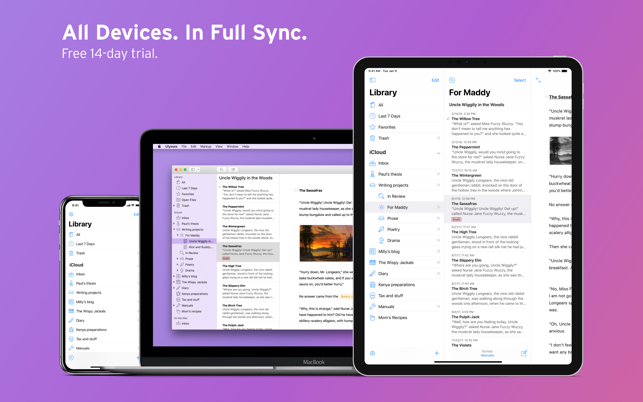 And since Ulysses offers feature parity across macOS and iOS, it doesn’t matter where you are or when inspiration hits: All its tools, and all your texts, are always at your fingertips. 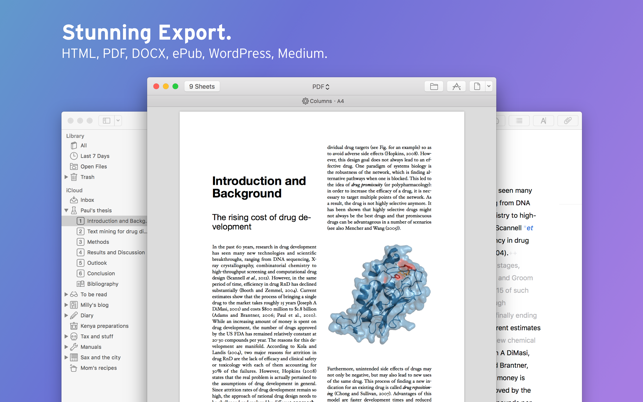 Ulysses’ export is flexible enough to cover any writer’s needs: Transform your text into beautiful PDFs, Word documents or eBooks. Or export HTML code, ready to be used anywhere on the web. You can even choose between a variety of pre-made formatting styles for all kinds of purposes, or create your own and share it with other users. Do you blog? Ulysses’ offers best-in-class WordPress & Medium publishing. You can post to WordPress from right within the app – complete with images, tags, categories etc. Publishing to Medium works just as easy, and both offer a built-in preview to proof-read before submission. Ulysses requires a subscription. We offer monthly and yearly subscription plans, as well as a special discount for students. There’s also a fully functional 14-day trial, so you can test Ulysses (including export and sync) before you commit. All plans unlock the app on Mac, iPhone and iPad, and feature full iCloud synchronization. Duration and price of each subscription are displayed in Ulysses’ storefront, updated at the time of purchase. Payment will be charged to iTunes account at confirmation of purchase. Subscriptions automatically renew unless auto-renew is turned off no later than 24 hours before the end of the current period. Subscriptions and auto-renewal can be managed/turned off in the iTunes account settings. Any unused portion of a free trial period is forfeited as soon as a subscription is purchased. Student subscriptions automatically terminate after their duration, as shown in Ulysses’ storefront at the time of purchase. - Fixed a crash during startup. - Fixed a crash when inserting an empty image. - Fixed a crash when editing text while the Navigation panel was detached. - Fixed a crash while a backup was created in the background. If you're happy with the app, please rate it, or even leave a review. This is a great way to support us indie developers. Thanks a lot! I am a journalist as well as an amateur creative writer, and Ulysses suits my needs for every type of writing I do. 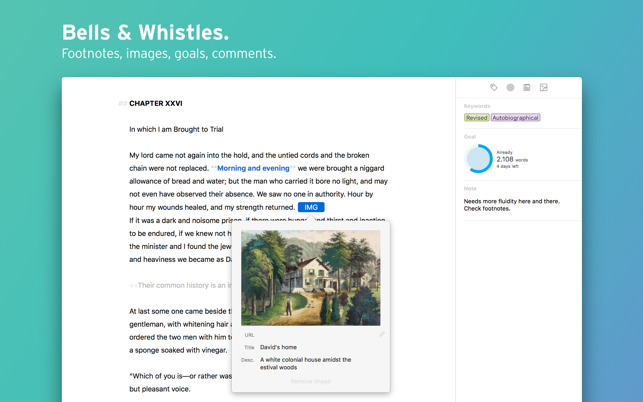 Look no further: Ulysses is the best writing app on the market. This app not only provides a clean and unintrusive space to do my writing, but it's also packed with loads of features if you need them. 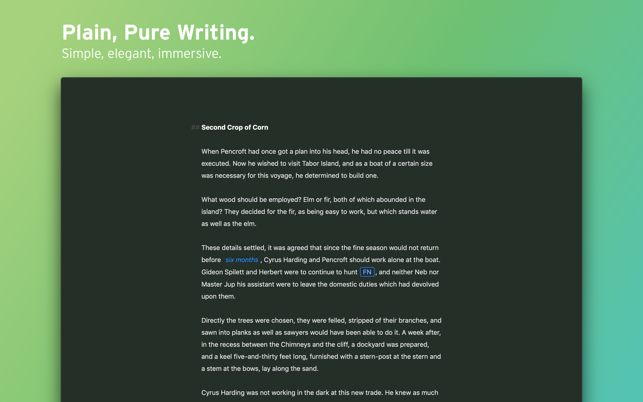 Ulysses is fast and lightweight, unlike some of the bulkier writing apps I've tried. The sync between the iOS and Mac versions is instant (and the mobile apps are equally beautiful and easy to use). The focus mode and writing goals motivate me to actually sit down and WRITE. I also love the ability to view a number of sheets together in a single, streaming editor, because this allows me to sketch an outline with multiple sheets and then fill in as I go. The most recent update (March 2019) with the split-screen editor and the keyword manager are just a few of the significant new features that have rolled out since I became a happy subscriber to this app last year. I am thrilled to support these developers with a subscription when it means a stream of quality new feaatures like this. Thank you for making this app and continuing to develop it with such attention to detail. It's clear how much thought and effort has gone into the design and usability of this program and it is very much appreciated. I used Ulysses from its first release for notes, project outlines and every draft until I finally imported into Word. Then Apple released the iPad and I went through dozens of text apps to replace it, none of which worked. I was so glad when they released the iPad version so I could use it on both platforms. I've worked with Word, Pages and Scrivener. None have the utility of Ulysses. I even write my Medium articles in Ulysses, add the block quotes and images and import the file into Medium directly. I still haven't successfully customized any style sheets, but once I do, I may bypass Word entirely. Once you open the popup to export there's a large button with text "Preview ..." and a small folder icon in the middle of a row of icons in the upper right, that's where Save is buried. Another Preview button, Copy to Clipboard, Save, Open in..., Send ... took a while to find that. But a bigger issue with Export is that with the feature to set image size, you're still exporting original images just restricting the width when displayed in HTML pages. So a post with a ton of images might time out when posting to Wordpress or you might end up with huge image files if you opt for HTML (to ftp somewhere). For people on a mobile device, viewing your page will be slow.